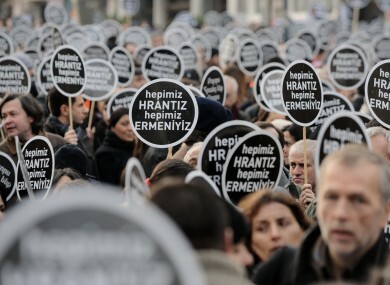 About 20,000 people took to the streets of Istanbul to mark the five year anniversary of Turkish-Armenian journalist Hrant Dink – and vented outrage over a trial that failed to shed light on alleged official negligence. Protesters hold signs reading "We are all Hrant, we are all Armenian" as tens of thousands of protesters march to mark the fifth anniversary of Turkish-Armenian journalist Hrant Dink's murder in Istanbul, Turkey, Thursday, Jan. 19, 2012. TENS OF THOUSANDS of protesters marked the fifth anniversary of a Turkish-Armenian journalist’s murder today, as outrage continues to grow over a trial that failed to shed light on alleged official negligence or even collusion. Human rights activists placed red carnations on the spot in Istanbul where Hrant Dink was gunned down in broad daylight outside of his minority Agos newspaper office by a nationalist teenage gunman. Tens of thousands marched for justice, a call shared by Turkish leaders and leading businessmen who expressed unease over this week’s sentencing of one man, Yasin Hayal, to life in prison for masterminding the killing, while another 17 were acquitted of charges of acting under a terrorist organisation’s orders. The court neglected to issue a verdict about a 19th suspect. “The verdict is tragic and is weighing heavily on the conscience of everyone in Turkey,” Rober Koptas, Dink’s son-in-law and editor-in-chief of Agos, told AP television in an interview. The gunman, Ogun Samast, was sentenced to nearly 23 years in prison in July by a separate juvenile court. Fikret Secen, deputy head of the prosecutor’s office in Istanbul, said Thursday that it has appealed the 17 acquittals to Turkey’s Court of Appeals. He said the prosecutors also are appealing the verdict against Hayal because he was not convicted of being a member of a terrorist organisation. Umit Boyner, the head of Turkey’s influential industrialists’ association TUSIAD, said the existing verdicts have “shocked” the public. “What we solidly see in this trial process is that the belief in justice has been shaken and weaknesses in our justice system have been revealed,” he said. Turkey’s leaders have vowed a thorough investigation into Dink’s killing — signaling dissatisfaction with Tuesday’s court ruling by a panel of judges. Dink’s lawyers have said they also will appeal the verdict, saying the investigation was flawed because the judiciary had not followed up on evidence alleging officials may have been aware of the plot. President Abdullah Gul said the case amounted to a tough test for Turkey, a democracy with a mostly Muslim population that seeks membership in the European Union. “The conclusion of this case in a transparent and just manner in line with our laws is an important test for us,” Gul said on Thursday. Koptas responded that politicians were feeling guilty because they had done nothing in five years to ensure justice. Rustem Eryilmaz — who led the panel of judges — sparked even more fury when he told the daily Vatan in an interview published Thursday that he was not satisfied with the decision, acknowledging that the court had failed to reveal allegations of negligence or collusion between the state and the suspects. Eryilmaz said the judges felt pressure to issue a verdict after the 4-1/2 year trial, and did not have time to examine thousands of telephone conversations at the scene on the day of the assassination. Deputy Prime Minister Bulent Arinc said Eryilmaz’s remarks were unacceptable and questioned why and how the court had neglected to issue its verdict on the 19th suspect. “The assumption that only one person was responsible for this incident has damaged the public conscience,” Arinc said Thursday. Dink had sought to encourage reconciliation between Turkey and Armenia, but several years before his death he was prosecuted under Turkish law for describing the early 20th-century mass killings of Armenians as genocide. Turkey, however, denies the deaths constituted genocide, saying that the toll has been inflated and that those killed were victims of civil war and unrest. Email “Turkey: Tens of thousands mark journalist's death”. Feedback on “Turkey: Tens of thousands mark journalist's death”.